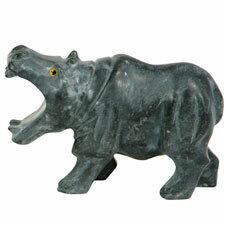 This hippo has been handcrafted by the men and women at Peruvian Gems, an artisan collective based in Lima, Peru, which has created a sustainable business by utilizing Peru's abundance of natural stones to help artisans improve their standard of living. The talented artisans are paid a fair trade wage to create detailed and expressive animal figurines using just hand tools, stones, and their creativity. Measures 2� high x 1-1/4� wide x 3� deep. Fair trade imported.